A terminally ill dad will be able to make the most of his remaining days after Moray residents raised thousands to help him get out and about. Burghead man Keith Douglas was given just a year to live in May, 2014, and his family says he is “living on borrowed time”. The 56-year-old is battling a rare condition which leaves him prone to aggressive chest infections, and had both his legs amputated this year after suffering circulation problems. 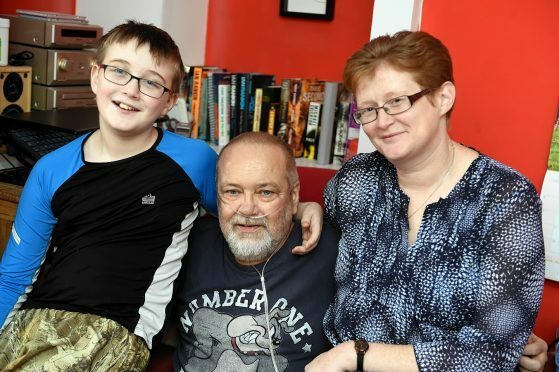 As Mr Douglas’s heart grows weaker, a family friend has launched a collection to cover the cost of converting the family’s camper van so that it can accommodate his wheelchair. The family say this will help them visit some of their most cherished spots across the country. Mr Douglas, his wife Karen and 10-year-old son Scott have been blown away by the generosity of locals who have rallied to amass £3,750 for alterations to the vehicle already. Some significant changes to the van have been made in recent weeks which makes travelling easier for Mr Douglas. Mrs Douglas said: “In May 2014 doctors said my husband had about a year to live, so he has obviously outlived that and is now on borrowed time. Mr Douglas worked at Johnston’s of Elgin as a loom technician before being stricken with ill-health. His condition, sarcoidosis of the lungs, has worsened over recent years and the powerful medication he takes to control it has had severe side-effects. Due to circulation problems caused by the drugs, both of Mr Douglas’s legs were amputated within months this year. He said: “Losing both legs has had a big impact on my life, with just the one I was still relatively mobile and could get in and out of my wheelchair. “But I just can’t do that now, and that is why the camper van means so much to us. The fund aims to reach £5,000 but donations over and above that will be used to maintain it as the family makes its travels.